"God asks no man whether he will accept life. That is not the choice. You must take it. The only choice is now." Anime based on video games is nothing new, but it's rare to see an example of one that truly breaks out on its own and flourishes, while still keeping the game in the minds of its audience. 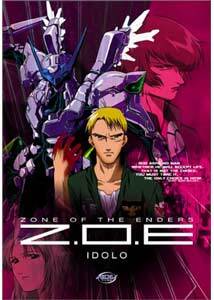 An excellent example is Zone of the Enders: Idola, the first in a short series of hour-long stories produced as prequels to the universe of the Playstation 2 video game Zone Of The Enders, the Game Boy Advance counterpart The Fist of Mars, and the upcoming sequel The 2nd Runner. The setting is the distant future, in a time when Earth has colonized the Moon and the planet Mars. Unfortunately, as the decades go on, those born on Mars as part of its natural community are lumped into a minority group. Because Martian people are weaker and generally different than Earthlings, Earth thinks it can oppress and dominate Martian society. In the year 2172, a war between Earth and Mars is is brewing. In the year 2167, though, things are only just beginning, and this is the year in which Idola is set. While Mars grits it's teeth under Earthly oppression, its military still tries to build up strength for a future rebellion by using giant robots called LEVs. One of the soldiers, Radium Lavans, is especially angry about the whole situation. His good friend and teammate Viola as well as his girlfriend, Dolores, have all suffered greatly under Earth control. Lavans assumes his attitude and behavior while piloting his LEV will get him demoted, but instead, he is assigned to a mysterious, secret project. He soon learns that Mars has been developing a new LEV Orbital Frame called Idola, using a very rare but almost magical type of metal called Metatron, which makes the robot virtually indestructible. Lavans test pilots Idola and immediately becomes enamored with it. The strange machine bonds with him, rejects other pilots, and soon unleashes powers never originally designed into it. His rage is unleashed through the machine, but he's unsure whether this is a good thing. Things turn dark for everyone and the whole program when a U.N. inspection team turns out to be Earth military spies. Idola is a slick combination of intense mecha action with a true sense of drama and story. I personally have never liked the tired Japanese animation trend of using giant robots as the focus of stories because it seemed there was never much depth to them. Here, however, there are clearly a few layers to the plot, all of which are developed with equal effort. It's dramatic and emotional without seeming drawn out, and this is especially true since we're witnessing what we know is a past event in the saga that led to the events of 2172. The stories of sacrifice, courage, and loss in the past is a very compelling idea, and it's also very creative because it means the writers and director are not forced to re-tell the story of the video game; instead, they've expanded upon it. This is what allows Idola to truly succeed as a fast-moving, exciting piece of work that leaves me desperate for the next volume. Image Transfer Review: A superbly pristine animation transfer can be found here, which is not surprising given that the show is only a year old and ADV usually delivers the goods with animation. It is sharp and clear and, despite some dot crawl on sharper edges, the detail in the hand-drawn work is quite impressive. Very cel-like and without any distracting background problems. Audio Transfer Review: Frustratingly, only the English dub is presented in Dolby 5.1; the Japanese is Dolby 2.0. Both mixes are very engaging however, with the original language track having a good number of surround effects and plenty of excitement and power behind the action sequences, with directionality in the front and healthy low-end bass. The 5.1 track is a bit more emphasized, but not dramatically so. The English dub is not bad, but is still awkward after you've heard the Japanese. Extras Review: There are four interview segments presented, each with a different individual who worked on the show, including director Tetsuya Watanabe. They help to reveal some of the inspirations and intentions behind Z.O.E. and offer a glimpse into the making of the project. In addition, there is a gallery of sketches and production drawings for many of the characters. The gallery is accompanied by the show's ending theme in stereo. There are some other ADV previews, and the disc is generally presented well with nice menus and a stylish red keepcase that matches the artwork. Idola is by no means enjoyable by only fans of the game, it is newcomers-frendly since it's a prequel. If you are a big fan of the games, though, you'll likely appreciate the subtle depth this adds to the idea behind Konami's original futuristic vision of a time when civil war is reborn on two different worlds.